Well, the forecast calls for what seems like a month of low 30’s to mid-40’s with lots of cute images of raindrops and snowflakes here in Washington. Although I am dreaming of seeing those first sprouts and pea shoots in a glimmering beam of early sunshine I am thankful for the present because it makes me appreciate the little things, like thick socks, hot tea, and a hearty soul comforting bowl of stew. When I’m in a crunch to make something for dinner, I normally head straight for my pantry to start finding ingredients to make soup. This combination stuck with me, because it was simple, and it utilized one of my underused grains, millet. 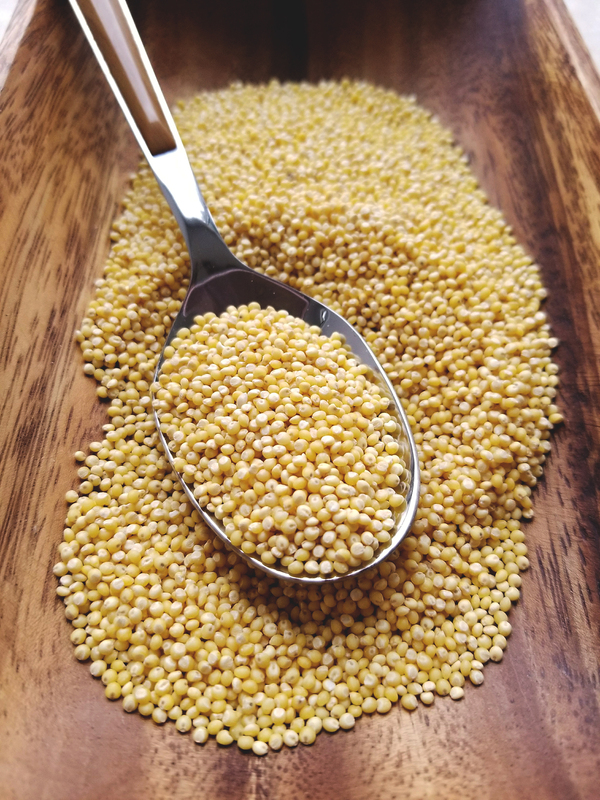 I love using millet, not only because of its wonderful health benefits, but because it is one of the “unique” ingredients that my husband could immediately recognize because he grew up with birds for pets. “Even though I know this is bird food, it’s still delicious” is a common phrase in our house, this time he really meant it. Millet is the most common ingredient in bird feed, but it should also be a common ingredient in your pantry! This grain is nutty, gluten free, packed with fiber and minerals like Magnesium, and it has been one of the base cereal grains for some of the great nations of the world. It’s history even goes back to biblical times (Ezekiel 4:9). This tiny grain can be fluffed like rice, ground to make bread, creamed like porridge, or thrown into soups and chilies to add unique taste and texture. 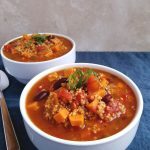 This chili comes together with relatively little effort, utilizing pantry staples like canned tomatoes, beans, and spices. 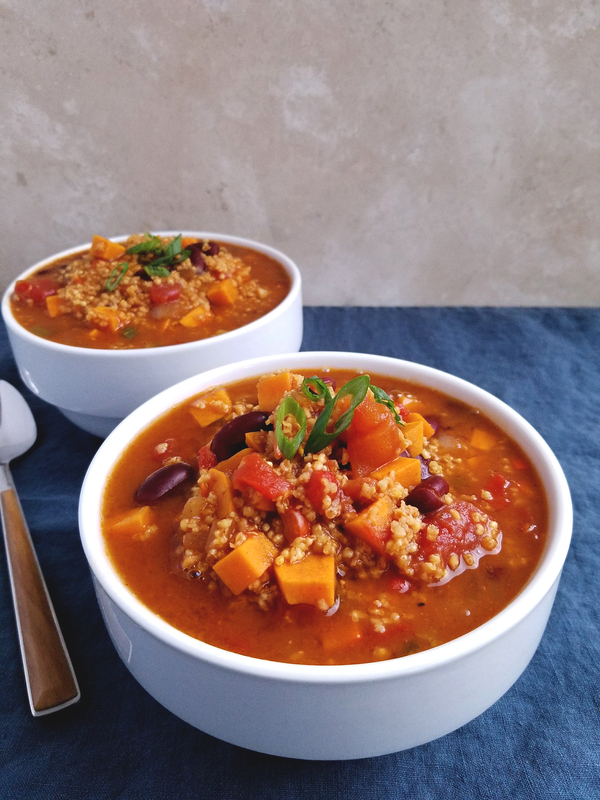 The combination of the nutty millet, with the subtle sweetness of the sweet potatoes, bright tomatoes, and creamy beans, leads to an overall low-fat, flavor packed, nutritious stew. If it gets too spicy for you, you can always add a delicious swirl of almond butter to mellow out the heat! 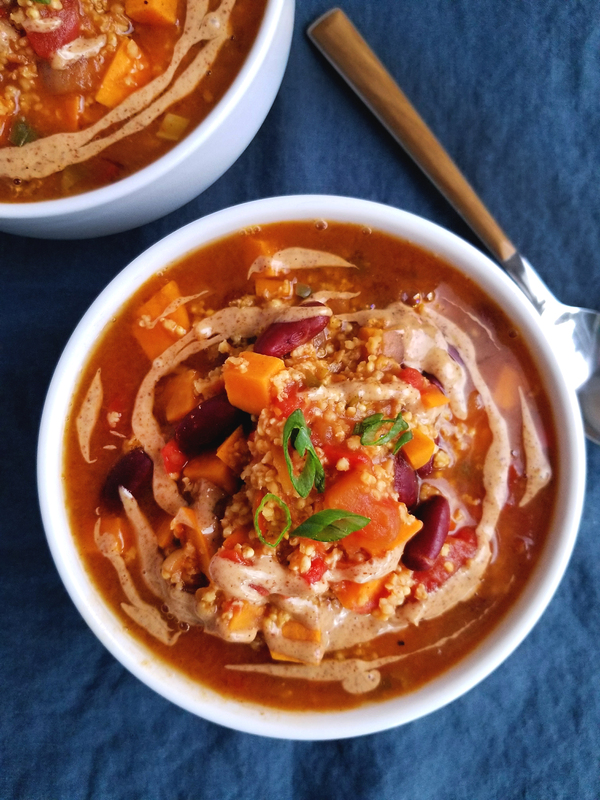 I hope this humble pantry stew will fill you with comfort, warmth, and goodness. 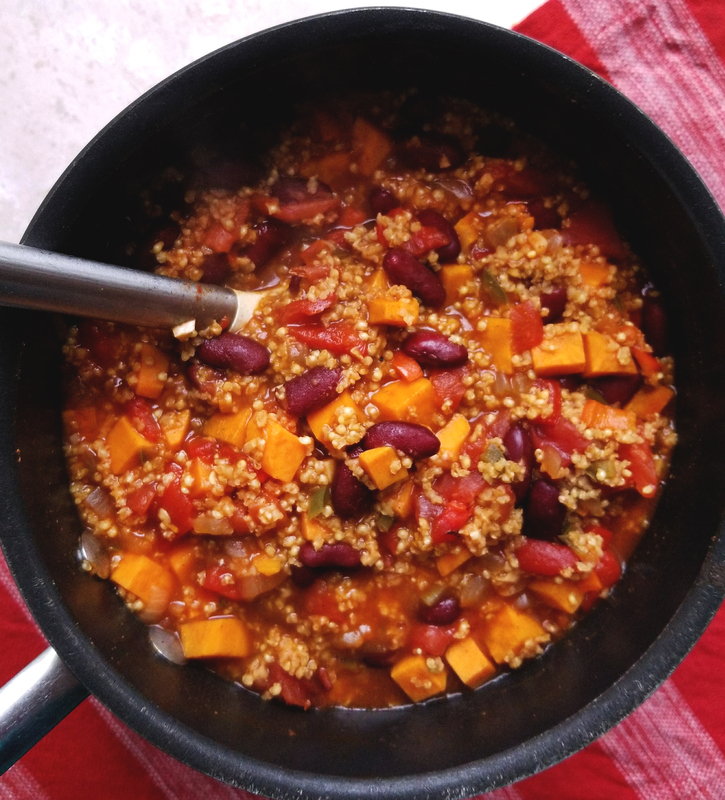 This hearty gluten-free and veggie packed stew is sure to become a new favorite. Easy to make, 10 ingredients, and delicious! In a large sauce-pot over medium high heat, sauté the onions with a splash of vegetable broth until slightly translucent, about 2 minutes. 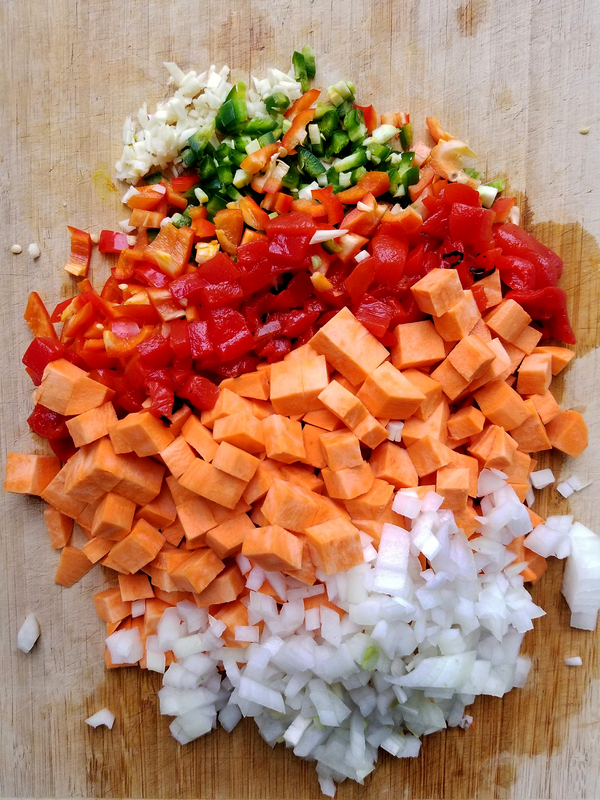 Add the garlic and jalapenos and sauté for another minute. Adding a splash of broth if the pan is getting dry. Add the chili powder and bell peppers and stir to coat the spices. Add the potatoes, millet, tomatoes, beans, and vegetable broth and stir. Bring to a boil, then lower heat and simmer for 25-30 minutes. Season with salt and freshly cracked black pepper to taste. *The stew with absorb all the flavors the more it sits, and the millet will also absorb the liquid. When you reheat the stew, you might need to add a little broth or water to thin it out. *This will keep in the fridge for 4 days or in the freezer for a month.